George Rene Emery was born in Paris on 5th November 1895 the only son of Artist Painter Aime Leon Paul Emery. Everyone thinks all the fireworks were to do with some guy named Fawkes but this story will show that George created a few sparks of his own. Setting up his own Engineering and Electrical business in 1919, between the two World wars, George built several G.N. based specials at his works by the railway bridge in Station Road, New Malden, Surrey. George was a skilled engineer and it is not generally known that soon after the First World War in 1919 he designed, patented and built in his Engineering shop a rotary vane engine somewhat similar to the Wankel project of forty years later. Peter Emery, Georges youngest son described the engineering works as “a maze of pulleys and counter shafts all driven by a National Gas diesel engine powering all the lathes, milling machines, drills and power for the lighting” .The works also included a small Radio and Electrical section upstairs which Peter found fascinating and so on Saturdays, Peter would accompany George to the works, in the Gwynne 8 engined special and head to the room, building and experimenting with crystal sets and two valve radios. The radio and electrical part of the business was however to be subsequently closed down, most of the odd bits and pieces that were left, and that Peter knew how to use, were allowed to be kept providing they were kept out of his Mum’s way. Soon after leaving school at 14, Georges eldest son, Paul Emery joined the company as apprentice to learn the Engineering trade. No one who met Paul failed to be fascinated by his ability at turning his hand to any practical aspect of mechanical engineering. It was while working for George that Paul became involved in cycle racing in his spare time and through this became quite a specialist in building his own machinery. George being an excellent mentor with outstanding theoretical and historical mechanical engineering knowledge helped encourage this and everything else that either Paul or Peter had wished to tackle. Paul was very self confident in everything he did. Predictably it was not long before he thought that he could run the show better than his teacher and it was about here that the fireworks first began. One day after many vociferous arguments he stormed off in a temper to join the Alta Car Company at Tolworth. George wondered how long this would last before Paul was back, because the Director Geoffrey Taylor, like himself, was also a theoretical man. On the other hand, George also thought that if Geoffrey just wanted someone to build and maintain racing cars he would be hard put to find anyone better than Paul Emery. After Paul’s departure, peace returned to the shop and George looked to begin modifying and developing his GN special to be more competitive in circuit racing. The car was fitted with a new front axle to lower the chassis and a wider front track. Major engine changes to get more power involved machining the cylinder head combustion area and valve ports, all the while explaining to Peter how all these steps would improve the performance. Peters first real close hand experience with motor racing was in 1935 when at ten years old, George took him to the Ford Gymkhana at Brooklands and was to be taken in a Ford V8 Saloon for three laps around the outer circuit at over 100 mph. Here he met some of the stars like Kay Peters, Freddy Dixon and Arthur Dobson whom Peter was to bump into with Paul many years later at the Racing car show in London. 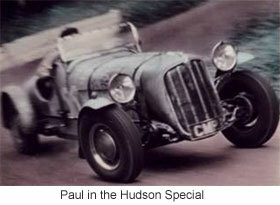 Paul was also at Brooklands with the Alta, driven by George Abecassis. Peter remembered the Alta chassis was quite technically in advance of its rivals with independent suspension and although the engine had a number of innovative advanced design features. The car was historically rather brittle compared with the Baby Austin and the ERA cars and faired no better in the reliability stakes at Brooklands event. 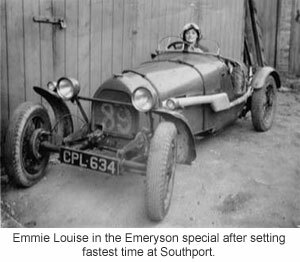 Until the start of World War Two, apart from accompanying George on the Saturday trips to the shop, Peters involvement with motor sport was purely as a spectator and although assimilating a great deal of motor car design theory, partially through fascinating technical discussions with George and through living with the cars, Peter did not at this time have any direct active input to Emeryson . Paul’s Emerys practical skills were not restricted to his manufacturing tasks, he was also an incredibly good driver and had aspirations that Geoffrey Taylor might let him drive one of the Alta’s at one of the minor race meetings. What would have been the result if he only had we can but wonder but as it became apparent that it was not to be, Paul patched up the one of his many fallings out with George and persuaded him to let him enter the Gwynne 8 engined special in the vouterette race at the 1938 Donington G .P. Putting up a quite incredible driving display, the car unfortunately retiring when a con-rod came out through a large hole in the crankcase. A desperate situation as they had to drive it home, but resourceful and undaunted, Paul put a jubilee clip around the crank shaft journal to stop the oil flow, removed the push rods from the affected cylinder, screwed on a leather patch over the hole and drove it all the way back to New Malden. 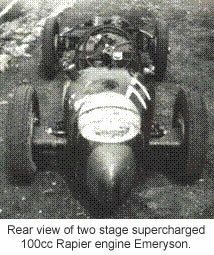 The Gwynne 8 car was re-engined with a Riley nine after a Donington Park meeting mishap. Late in 1938 the Emery family moved into a flat, complete with full size snooker table, above the showroom of Georges new premises to the East side of the Station. Mains electricity in the workshop was a especially appealing to Peter as the diesel engine found in the previous shop was particularly difficult if George was not around or too busy to start it. Soon after watching the Donington GP in September 1939 with the Mercedes and Auto-unions dominating the race motor racing war soon intervened. The Emery works had been awarded a Ministry contract making Aircraft components in association with Coombe Motors just up the road from the new premises. Peter was due to start at Beverley Technical School but George persuaded Peter that based on his experience in the RFC. in 1914-1918 it might well be advantageous for him to go and work for him at the new company. Peter would be in a reserved occupation, get some technical qualifications should the school continue unchanged. Paul opposed the Coombe Motors/ Emeryson Consortium trying very hard to persuade his father to proceed with it, insisting that the two parties had nothing in common and it would not last. Paul maintained that Coombes only wanted his machinery in order to get the Ministry contract and that the Emerys works machinery and premises would have justified a Ministry contract in its own right anyway. As it turned out that was one of the few times that Paul’s decision making on business matters was absolutely spot on. Paul left Alta Cars to go to Sir George Godefrey and Ptns. a company making pressure cabin blowers and various aircraft components. Peters and Georges position with the consortium did not last very long and both of followed Paul to Hanworth. The factory at Hanworth was subsequently flattened by a land mine and the Emery family moved from Hampton, further up the river to Henley to an anticipated underground factory at Warren Row. Peters technical qualifications seemed to have been put on a back burner for the time being, the next few years were years that we could all well have done without with Pam and Muriel being evacuated to Coalville near Leicester due to the danger of the increasing air raids over London. After a spell at Warren Row Nr. Henley in the underground Factory George left and went to the Vehicle Research Establishment. Paul moved on to Marine Mountings and then to Dowty Equipment at Cheltenham using his Hudson Special to return to Twickenham week-ends. Peter joined the Air Transport Auxiliary at White Waltham Airfield. Pam and Muriel had returned home, the nightly air raids having been replaced by VI rockets but these were far less stressful with only the occasional big bang, once or twice a week in the families area. In fact after dancing at the Palais in Hammersmith it was part of the entertainment watching half of them explode as they re-entered the atmosphere. It would was however some time yet before any thoughts could be directed towards motor racing again. The following few years for the family were perhaps rather uneventful apart from Muriel meeting and becoming engaged to Ernie Parsons, stationed at the nearby Airfield. Paul having managed to get his Hudson to run on a mixture of petrol, diesel and benzyl, over the course of about 4 months managed to accumulate enough for a trip down to the Scilly Islands. Such was the lack of power that when facing Porlock that they resorted to going up in reverse gear. When arrived back home from the trip at the end of August Peter finally received his call up papers for the R.A.F. After 8 weeks training and selection as a Flight Engineer and the war drawing rapidly to a close, Peter was deemed surplus to requirements, discharged and returned to the A.T.A. With the war in Europe finally in sight the ATA was disbanded and Peter was more than a little surprised to receive call up papers to report to Colchester for army service. Peter’s years with the ATA for which he had received a Certificate of Service from the Commanding Officer was not recognized by the Secretary of State for the Air, Archibald Sinclair as authorized war service. Any appeal against this decision was rejected, even though the final year service was in the RAFVR awaiting active training as a flight engineer. The letter received was not unlike what you would expect under National service in that all the skills and knowledge absorbed concerning the latest military aircraft was now superfluous and in their wisdom, Peters skills were put to organising supplies that were no longer needed now that the war would soon be over. Once block training at Colchester was completed he was posted to Thatcham Ordnance Depot near Newbury in Berkshire in the RASC, to the drawing office where at least some of his skills could be made use off. George all this time was still working for the Vehicle Research Establishment at Farnborough and having bought a bungalow at Hawthorn Hill near by and with the end of the war was in sight, the priority was to build a workshop. Planning permission was given for a large double garage and small workshop extension which subsequently was to be the birth place of the Emeryson 1100 twin Supercharged Lagonda Rapier engined race car. Paul was by now running a successful motor repair business at Twickenham.